Five Seattle chefs at the top of their game. Between them, they have 19 James Beard award nominations, 16 restaurants, and countless rave reviews from some of the nation’s toughest critics. They come from diverse backgrounds, cook wildly different cuisines, and create dining spaces true to their unique styles – but one thing unites them all – they’re among the best of the best. And oh, they all happen to be women. That’s no small feat in an industry overwhelmingly dominated by men. According to a Bloomberg study, women occupy only 6.3 percent of head chef positions in the U.S. And even fewer female chefs achieve the visibility and critical acclaim of their male peers. But these five chefs are part of a growing number of women changing the status quo. And oh man, are we lucky to have them in the Seattle food scene. Not only is their food to-die-for and their style impeccable, but I’m personally inspired by each of them. Over a series of five posts, I’m going to take you on a culinary adventure through the worlds of Chefs Maria Hines, Monica Dimas, Rachel Yang, Shannon Martincic, and Renee Erickson. Let’s start with a pioneer of the sustainable dining movement: Chef Maria Hines. 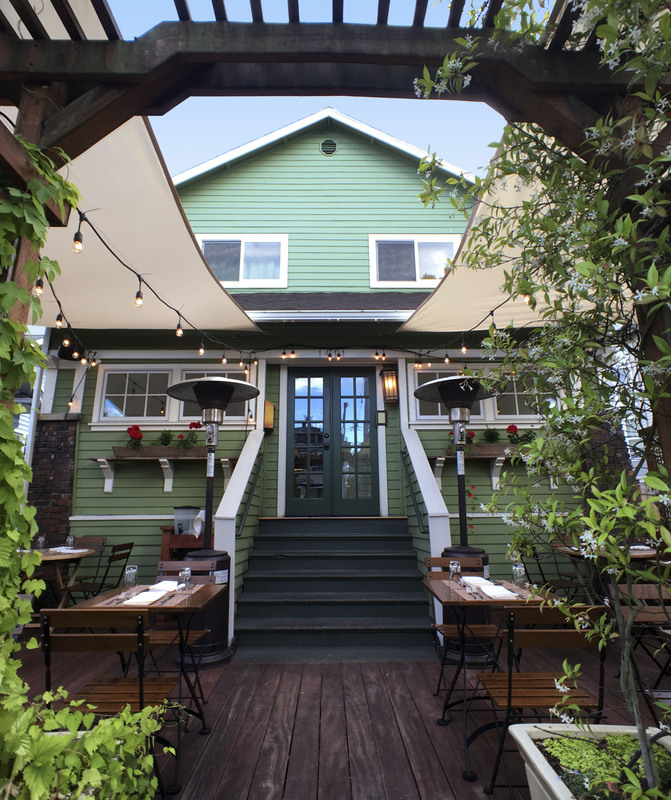 Walking into Tilth is like stepping into a good friend’s home. You pass under a wooden trellis covered in vines, cross a sweet little patio adorned with string lights and open the door to a green Craftsman-style house. No need to knock — you’re welcome to walk right in. But unlike similar bungalows lining Seattle’s streets, this one houses a lovely restaurant. Focused on locally-sourced, organic food, Tilth was the first of Chef Maria Hines’ now three Seattle restaurants. When Tilth opened 10 years ago, it was only the second certified-organic restaurant in the nation. Now there are over 100. Chef Hines’ food is insanely delicious. And everyone agrees. The woman has four James Beard award nominations, was named one of Food & Wine’s 10 Best New Chefs and earned a rave for Tilth in The New York Times, for god’s sake. She’s saving the world. In addition to running her three certified-organic restaurants, Chef Hines is involved with numerous organizations committed to building a sustainable food system. Good food and an even better cause. Safe to say, expectations were high as I stepped into Tilth’s cozy space on a warm Sunday evening. I couldn’t wait to taste Chef Hines’ extraordinary creations. Tilth’s interior is as intimate and comfortable as its exterior suggests. You’re literally sitting in someone’s living room. The 15 or so tables are tucked close to one another in this small space, but rather than feel awkward, it’s pleasantly snug. After settling into our corner table, I looked over the menu. There are about 15 dishes on it, ranging from beef striploin with charred radicchio to English pea flan to seared albacore tuna and green chickpea. It’s a beautiful representation of what’s fresh and seasonally available here in the Pacific Northwest. And a godsend for the indecisive eater: you can choose between a small or large version of each plate, so you can try more dishes. Phew! FOODIE TIP: Instead of ordering à la carte, spring for a tasting menu (5 or 8 courses for $70 or $95, respectively). And for you oenophiles, add wine pairings to each course for a little more. 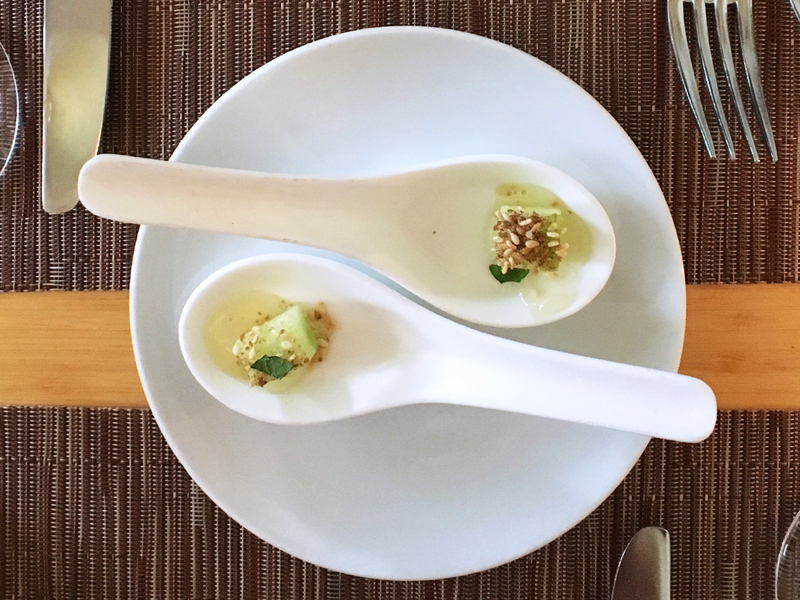 First up, a nice treat from the kitchen: an amuse-bouche of cucumber with mint, coriander and sesame seeds. It was incredibly refreshing and for such a little bite, surprisingly complex and exciting. Then, it happened. My favorite part of the entire meal. The best bread and butter I’ve ever eaten. Let me preface this by emphasizing how particular I am about bread and butter. Thanks to my Belgian mother, I was ruined at a very early age by my grandpa’s warm-from-the-bakery bread and flavorful, farm-fresh butter. Tilth’s housemade sourdough was perfect: soft and tangy with an extremely crunchy, almost (but not quite) burnt crust. But the real standout was the house-churned butter. Unlike the pale, tasteless butter of the grocery store variety, this was richly yellow, creamy and full of flavor. A few salt flakes sprinkled on top of my generously buttered slice and my night was already made. This isn’t to say that the rest of the meal didn’t meet my unreasonably high expectations — it did. 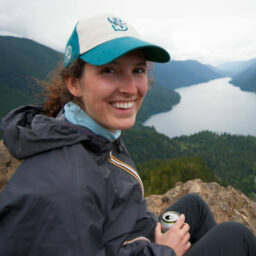 Everything was fresh, beautiful and true to Seattle’s sustainable and unpretentious soul. This bread and butter epitomizes what’s so special about Chef Hines’ food for me. The dishes she puts out seem simple — maybe surprisingly so for those looking for a more elaborate, gourmet meal — but they are crafted with incredible care. She brings the best out in each ingredient. Salmon is cooked to its flakiest, tastiest best. 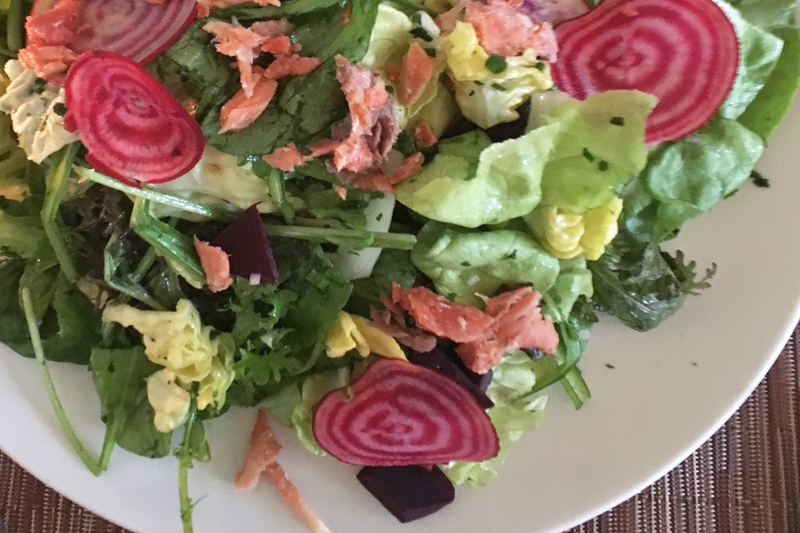 Beets are firm, slightly crunchy and lightly sweet. Delicate fingerling potato chips strike the ideal balance of crunchiness and greasiness. Much of this understated perfection comes from Chef Hines’ careful sourcing of high-quality, organic ingredients from the region’s best purveyors. And her restaurants’ organic certification requires her to make a number of basics from scratch — hence my transcendent bread and butter. 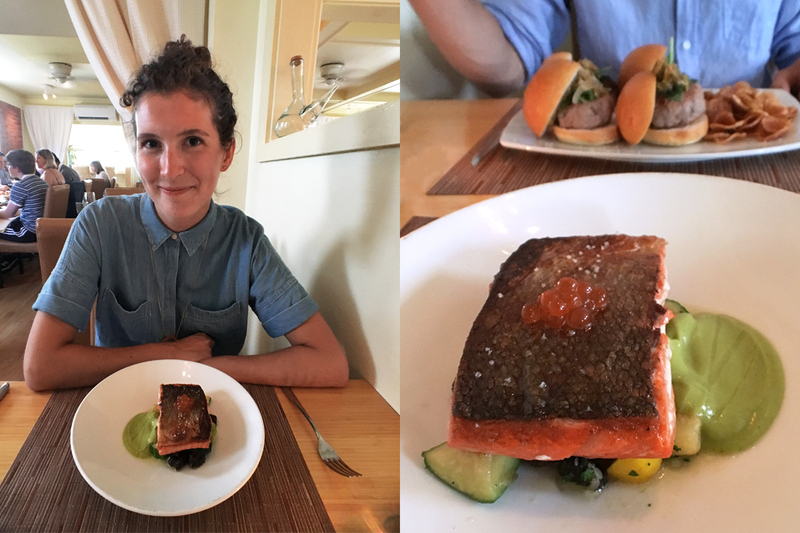 But locally-sourced ingredients and house-made staples don’t add up to the sheer loveliness of my meal at Tilth. No, there’s something else at play in Chef Hines’ cooking and restaurants. If I had to define it, I think I’d call it a whole lotta heart. You feel it when she invites you to dine in her little green house. You see it in the hand-written list of dairies providing the day’s cheeses. You hear it in the server’s thoughtful, genuine suggestions. And you certainly taste it in every bite. 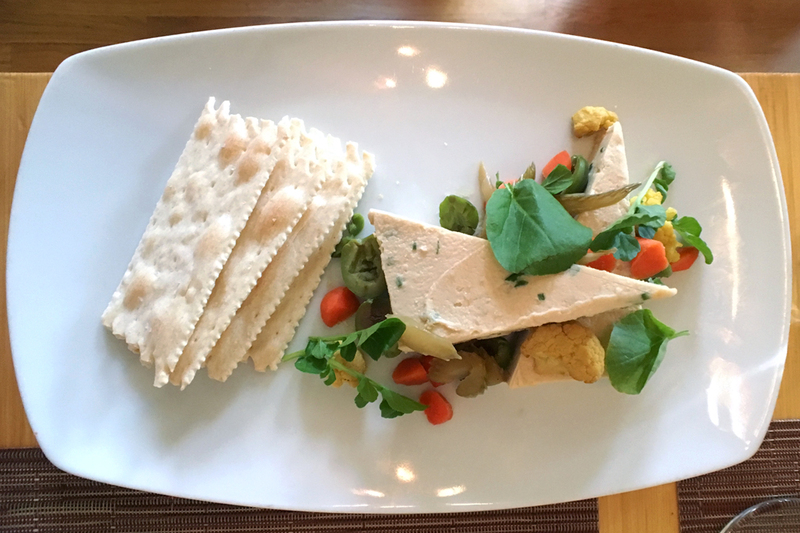 Tilth is located 10 minutes north of downtown in the Wallingford neighborhood of Seattle. It is open for dinner at 5pm Monday through Friday and for brunch (10am – 2pm) and dinner on Saturdays and Sundays. Reservations recommended. Chef Hines’ other two Seattle restaurants are The Golden Beetle and Agrodolce.